We hope you will love our Acrylic range of beautifully made fully personalised Baubles, hand finished with a cute silver charm, satin ribbon to hang and placed in organza gift bag perfect for presenting to a loved one. 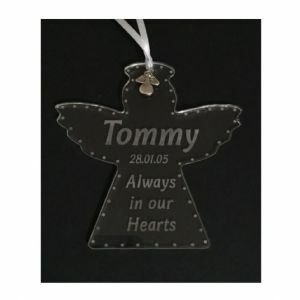 The acrylic is lightweight but strong making it perfect to hang on a tree or anywhere in the home. Size 9cm at tallest / widest point (depending on shape). Please let us know what you would like on the bauble when ordering by using the personalisation box.